Stuffed Brinjal Potato is very common curry cooked in allover India. Though it is cooked in different style in all parts/states of India with their own taste. Brinjal and potatoes are very easily available and affordable vegetables so this curry cooked in each and every kitchen. Try out this recipe and enjoy the difference. To surprise my husband for weekend dinner special I made this Italian style Pasta. Here I tried Spaghetti with basil pesto sauce along with which I included Asparagus too. It really tasted great with mild, melting touch of cheese with basil and asparagus. The basil pesto sauce is made in just 2minutes and can be preserved for months in freezer. Cook pasta of your choice and spoon out the sauce add veggies and yum it.Try this style of pasta for a change. All of us always want to prepare healthy food for the family. Drumsticks have rich iron content. Making dishes with drumsticks will be loved by everyone. This drumstick curry is one of its kind. Make this simple drumstick curry by following these easy steps. Recently I was reading a recipe blog posted by a blogger buddy, and to my surprise my son came to me and looking at the pictures he asked me to make same sandwich for him....On his request I tried this sandwich and it came out really yummy and we both enjoyed it very much. Now every other day my son ask me to make it for him..I followed recipe from Follow Foodie with little changes in it. Try this easy and healthy banana sandwich a perfect healthy breakfast for your kids. Vegetable Kurma is probably one of the authentic Indian delicacy which is a perfect side for all tiffin varieties. I wanted to share with my own style of vegetable kurma preparation which i use to have it as a side dish with Idiyappam, Appam, Parotta, Poori and goes well with all Indian breads. The Idea of having Idiyappam with Kurma is something to have spicy with mild combination dish. Try out this recipe and we will be posting varieties of kurma soon. Today's recipe is Vazhaipoo / banana flower chutney, it is very healthy yet simple and tasty too. This can be a good side dish for all south Indian Breakfast. Though it takes time for cleaning process I love to cook twice a month for its taste and health benefits. 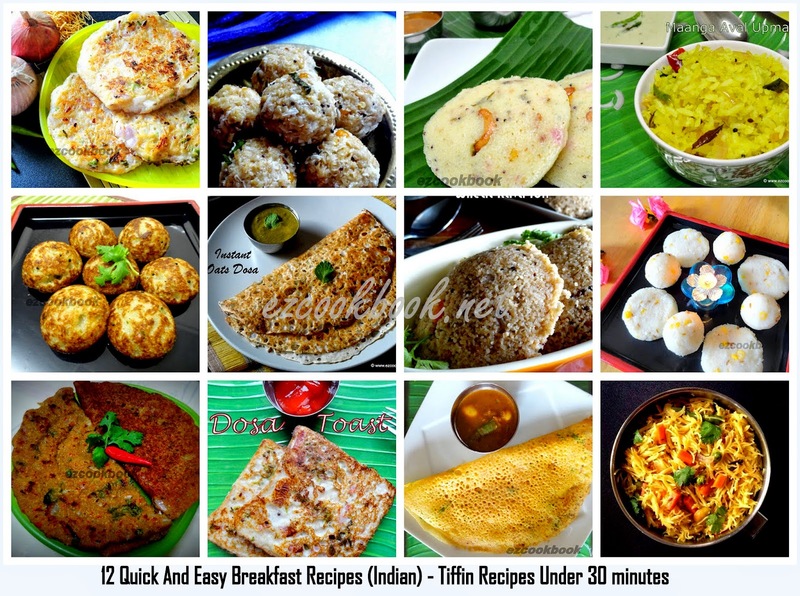 Try out using Vazhaipoo in Adai, chutney, vadai, paruppusili and many Variety of dishes. This cheesy pasta is a crowd pleaser dish for adults and kids as it is a perfect comfort food which whole family can enjoy. You can choose any shape of pasta and add variety of vegetables according to your choice. Try this easy recipe to make yummilicious cheesy Linguine pasta and please your family. Today I am gonna explain the procedure of traditional gujarati delicacy Khaman Dhokla also known as Nylon Khaman Dhokla, it is well known for its irrestible flavor. Its is very light,healthy,delicious,melting and nutritious too. I am gonna explain you how to prepare this dhokla instantly when you find hard time to follow original recipe preparation with all those fermenting steps. It is basically made with Chickpea flour/besan. It is steamed food and thus becomes healthy. There are many versions of dhokla are made with different batter and this is one among the recipes. Lets learn how to make this soft fluffy Khaman Dhokla at home with simple procedure. Palak Paneer is a traditional North Indian delicacy and is an integral part of the Punjabi cuisine. This healthy and awesome dish combines fresh spinach and Cottage cheese/Paneer in a creamy curry. Serve this amazing paneer dish with the goodness of palak along with roti/paratha or naan. Dry chilli chutney will definitely mouth water people who love spicy food. This is a most spicy chutney that always has a place in my refrigerator. You can make this chutney and refrigerate it for about two weeks. This goes well with Idli or Dosa. Sambal is basically malaysian style sauce which serves as a robust and versatile component in their everyday cooking. Tofu spelled as Tauhu in malay and this spicy tofu sambal goes well with any main course. Tofu Sambal is made as easy as possible if you are ready with sambal sauce. Here today I explained you easy sambal tauhu with a quick note. Chole Bhature is very popular dish of North India. 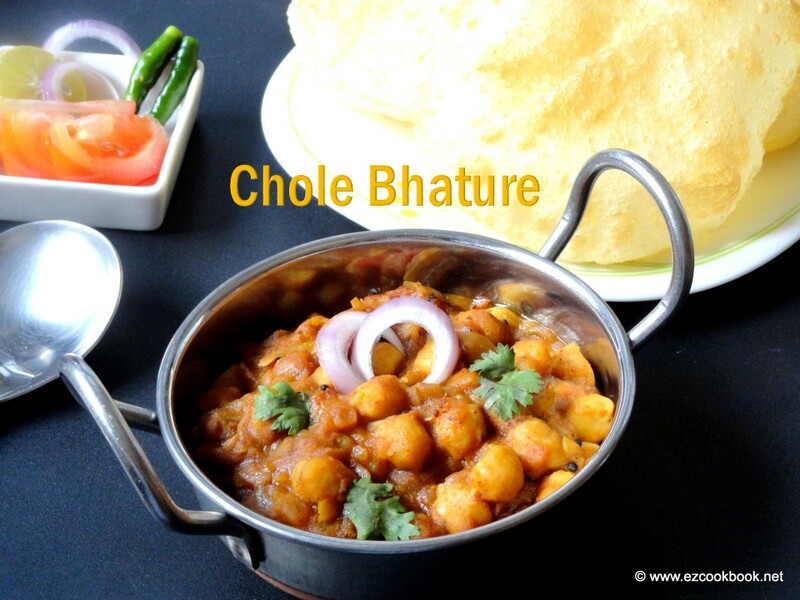 Chole bhature is a one hotpot mouth watering dish which is a combination of Chole - chickpeas cooked in spicy gravy and Bhatura - fried Indian puffed bread made with plain flour. Chole alone can also be served in different chat with tikkis, samosas and simply with bread. Enjoy this delicious recipe of Chole Bhature tonight. Relish your tastebuds with a cup of tea by munching this yummy and crispy lite paneer balls. This is as simple as quick to make dish with very basic ingredients. The crumbled paneer is blended with potato, bread crumbs. It is then seasoned with spice powder and deep fried. Have it with spicy tomato chilli sauce. 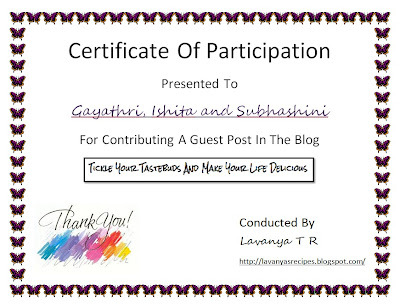 Hi friends as you all well aware of Lavanya From Tickle Your Tastebuds And Make Your Life is hosting a wonderful Event "Be my Guest With A Guest Post". Locate your visit to her space as she got beautiful space with oodles of recipes. Today its our chance to participant and our delicious recipe Soya Meal Wraps is been posted in her space. Do visit to this recipe here to know more about this healthy wraps which is an ideal dish for lunch box, picnic, party, potluck and this is very easy and quick to make sumptuous preparation. Friends and Ez Cookbook Viewers do check the ingredients and procedure to prepare this healthy dish in the above link and drop your valuable comments about the recipe on the comment page in her site and help us to win the prize as your comments are valuable and must. Lavanya gave certificate of Participation for Soya meal wraps. 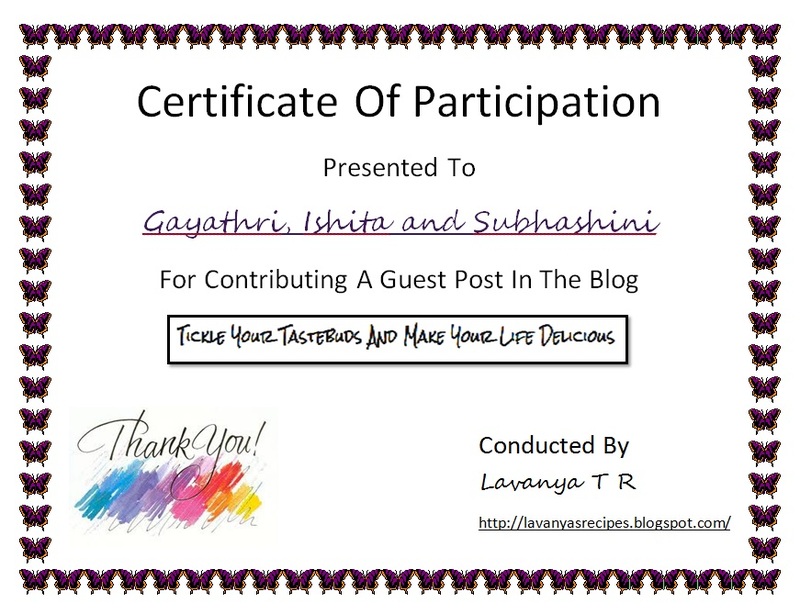 Thank you Lavanya for giving us such a wonderful opportunity to participate in this guest post event. You are hosting a great event to know about each other fellow blogger friends through this excellent idea behind this event. Thank You Sobha honouring us with this lovely trophy. 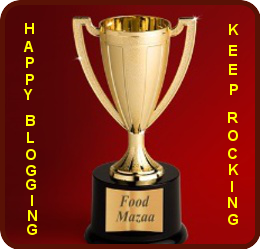 Happy and Proud to receive this trophy from our fellow blogger friend Sobha From Food Maaza. Shobha is such a wonderful friend and we came to know her very recently. She is in this blogger from2008 and happily blogging with her wonderful recipes and we loved loved all her collection. Congrats for all our fellow blogger friends for their awards. Locate your visit @ Shobha's Food Maaza to find interesting recipes. 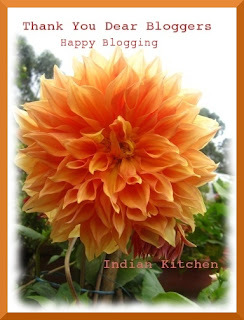 Thank You Preeti From Indian Kitchen for sharing this wonderful award along with other lovely fellow blogger friends. Congrats to all and happy blogging. Sprouts are called as "Power Food" as it is very good source of protein also contain useful amounts of fibre, potassium, and B-vitamins. They contain low levels of fat, cholesterol and sodium. It is useful for those of us who want to increase their alertness and mental abilities. Phosphorous is also necessary for healthy bones and teeth. Make this healthy Sprout Mung Dal for your family to complete their diet with lots of nutrition. Idli chilli powder is an excellent handy substitute when you really find hard time to prepare any sambhar,chutney, gravy for your staple south Indian breakfast recipes. Despite buying it from supermarket I use to prepare this podi always at home as it serves as a versatile component to prepare some curry, kolambu, sometimes will be very helpful to replace sambhar powder if you do not have it in hand. Try this simple and versatile podi to please your tastebud with Indian touch. Herbal Rice really made with herbal spices and so I meant it to be herbal rice. I use to prepare this recipe very very rarely at times when anyone at home fall sick to relish the tastebud. This recipe suddenly came across in mind when Pratheeba from Cook- Ezee who is currently hosting this month event herbes & spices with the ingredient basil & cardamom . Thanks Julie for hosting such a wonderful event EP Series : Herbs & Spices. We are happy to link our Innovative and healthy recipe for this event. Aapam is one of the authentic breakfast of south Indian homes. This tastes so good that it melts into your mouth with its heavenly taste. The preparation of batter is also so easy. I used to prepare it for weekends always to enjoy the taste. Make this heavenly dish and enjoy with your family. A combination of corn and methi will make your pakodas more tasty and healthy. Try this easy recipe to make tasty Corn Methi Pakoda in a evening to fulfill the hunger of your loved ones. If served with hot tea or coffee will make the evening more satisfying. We are happy to receive our third Award, the Liebster blog award from Preethi of Indian Kitchen. Thank you Preethi for Sharing us with this award.To reiterate Preethi has a wonderful site with lots of yummy recipes @ http://jopreet.blogspot.in/. Do visit her Indian kitchen filled with spices and love to learn really tasty recipes. She is so nice to share us with two awards in the same week. Awards are pouring into our space day after day this week which is overwhelming for us. Thank you Preethi for encouraging us and making us close to your heart. Joy of receiving award doubles when we share it with others. We are happy to share this Liebester blog award with all our fellow blogger friends. Thank you for encouraging us blogging with your support. Keep following and supporting. Wow posting #300 recipe today. Feeling great !! Briyani is always a mouth-watering Indian Recipe with its authentic spicy touch. There are many versions of briyani are made each with different and unique procedure. Today's recipe is quite simple, basic briyani made with vegetables and aromatic mint/cilantro flavor. This is my all time favourite and will be sure in my do to list for once a week and I love to have it simply along with Raita and salan... Try this simple and exquisite Indian delicacy at your space. Great to recieve this excellent Sunshine award from our fellow blogger Poornima from Easy and Homely CookBook. This is a great moment for us to receive award immediatedly following our first awards and we are overwhelmed with joy. Happy to receive this award from Poornima who is residing in singapore. Thank You dear Poorni for encouraging us with such a beautiful award. 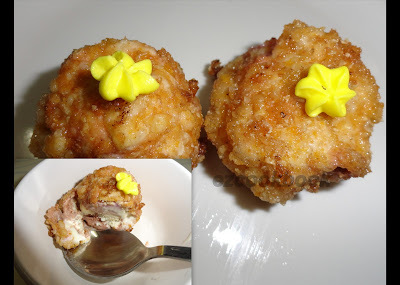 Poornima has got a lovely space with excellent collection of recipes, drop your visit @ http://poornirecipes.blogspot.sg for collection of her lovely recipes. We are happy and excited to share this Sunshine Award with our fellow blogger Friends as our token of love and share us few facts about you in a short to collect this award. 3. Subhie Arun From Subhie's Passion! Cool yourself in hot a afternoon with this Citrus Mint Cooler and get refreshed with more energy. Learn quick and easy recipe to make this cooler. Dry fruits and nuts are rich in iron. Prepare this milk shake for your kids and see them gulp it up. Aloo Methi is a side subji accompanying rice or rotis, combing the benefits of aromatic methi with the ever popular potatoes. Methi an amazing herb has got many powerful medicinal properties and can cure a number of ailments, reduce cholesterol, helps treat diabetes, prevents hair loss, aids digestion, treats skin problems etc. Here's a easy recipe how to make Aloo Methi. Happy to receive the inspiring and versatile awards from our fellow blogger friend. This is been given by Preeti from Indian Kitchen. Thank You Preeti for sharing these awards with us and its really amazing to receive our first award from you dear. You are so sweet and kind of sharing these awards with us..
We are happy share these awards with our fellow blog friends and wish them happy blogging. Friends kindly collect your awards. 4. KavithaKrishna from Whats cooking @ Kavitha's Kitchen?